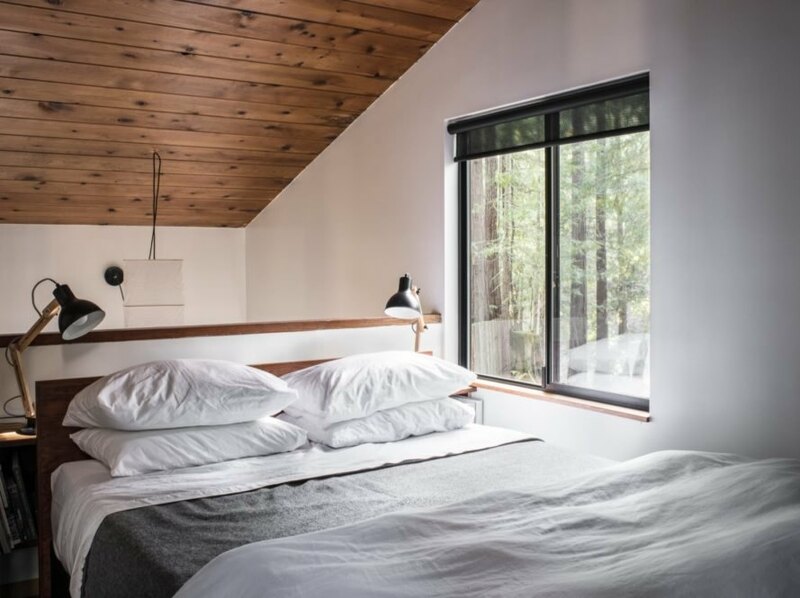 If you’ve ever dreamed of staying in The Sea Ranch community, here’s your chance to spend the night in one of the original mid-century cabins recently restored by Oakland-based design practice Framestudio. Originally designed by San Francisco Bay area architect Joseph Esherick in 1968, the Timber Ridge Sea Ranch Cabin was created as part of Demonstration Homes, a project led by developer Oceanic to show how the local design guidelines could produce a beautiful and low-cost getaway. 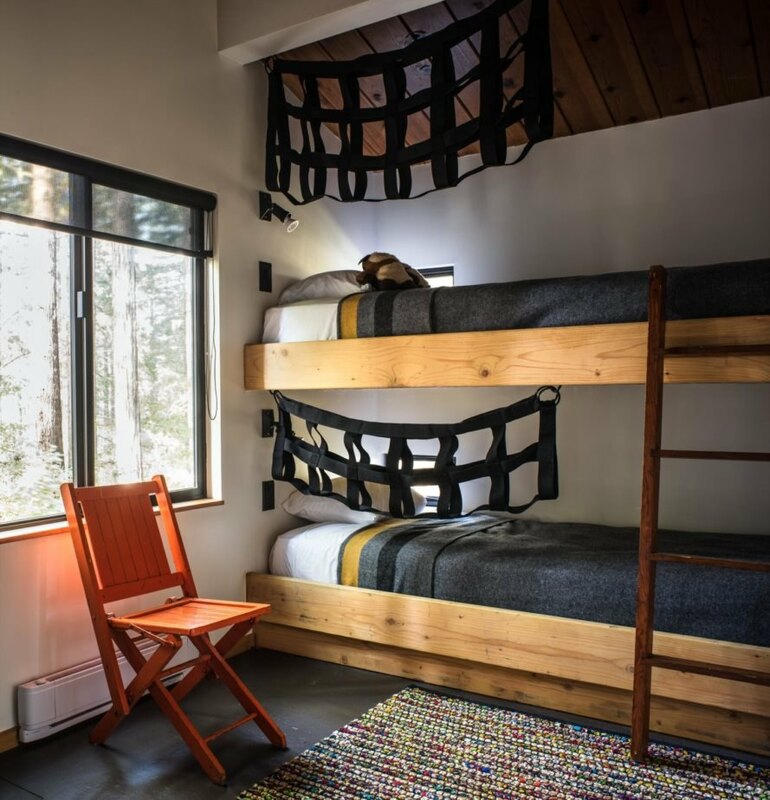 Renovated last year, the 684-square-foot timber cabin is available for short-term rentals on Esherick MiniMod. Set amidst a forest of towering redwood trees in the historic south end of The Sea Ranch, the compact timber cabin — dubbed the Esherick MiniMod — is a peaceful getaway. Framestudio sensitively modernized the three-level cabin while preserving its historic elements; the structure is one of the few remaining Demonstration Homes that’s still close to its original state. Priorities included an updated galley kitchen, increased capacity to sleep a total of six and secure storage areas. The home’s open-plan nature was preserved, but the layout of the two adjoining bedrooms can be manipulated with a new full-height partition that divides the sleeping area into two separate sections and slides away when not in use. 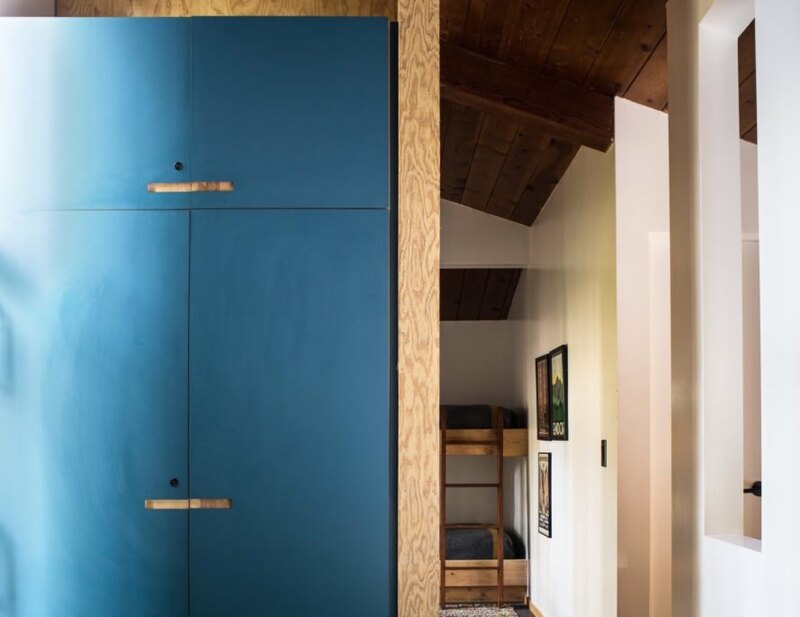 For extra storage, the bedroom alcoves were updated with blue laminate cupboards. Framestudio also added a built-in sofa that includes extra storage and a pullout queen-sized bed. 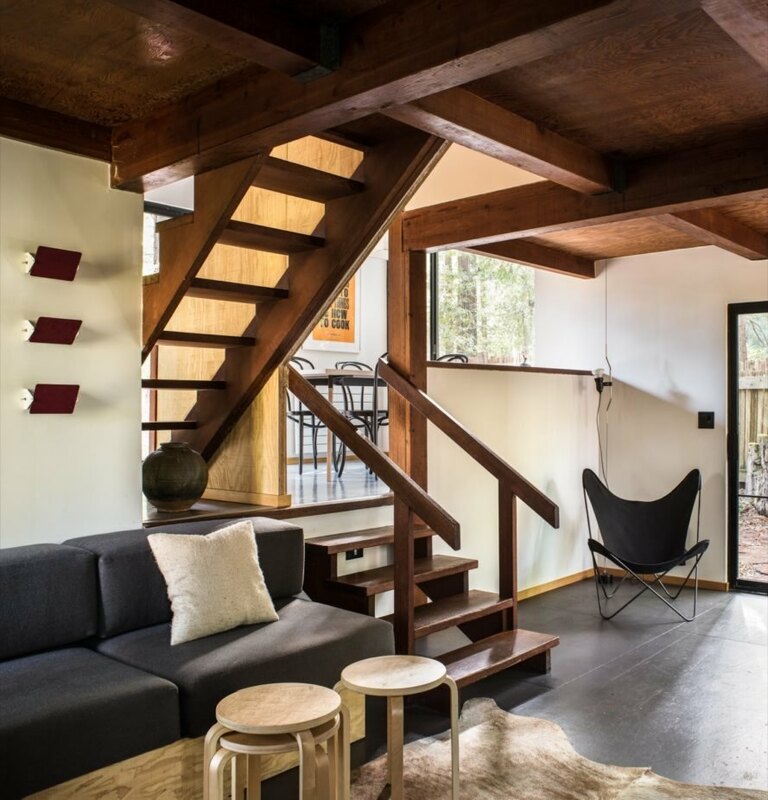 Rates at the Esherick MiniMod begin at $120 per night. Originally designed by Joseph Esherick, the Esherick MiniMod has been restored by Framestudio. The cabin is divided into three levels. 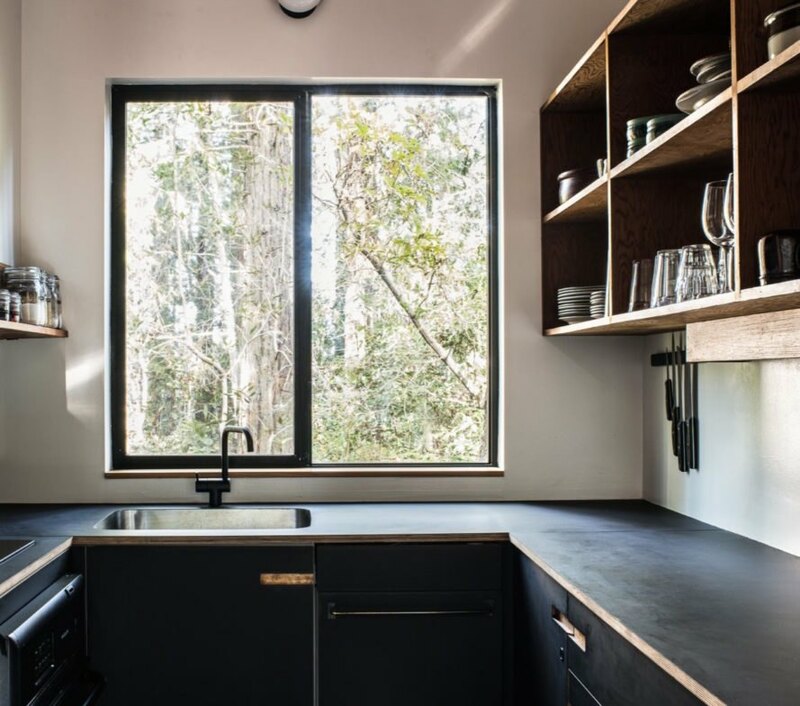 The updated galley kitchen features black laminate plywood cabinets. 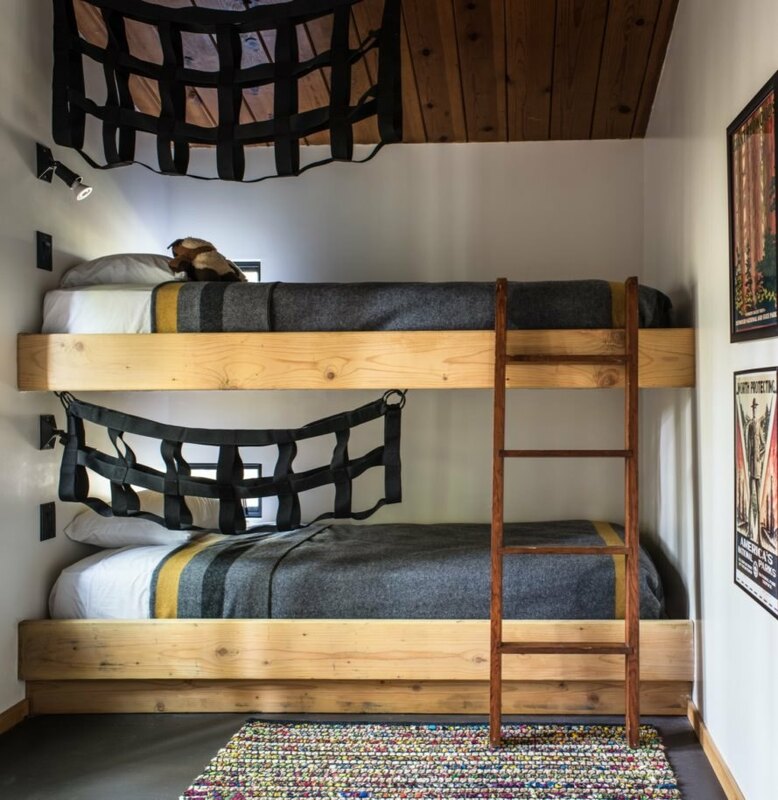 The cabin sleeps a total of six and includes two bunk beds. The bedroom looks out to views of the redwoods. A new partition divides the two bedrooms. New blue laminate cupboards offer secure storage. The cabin be rented starting at $120 a night.